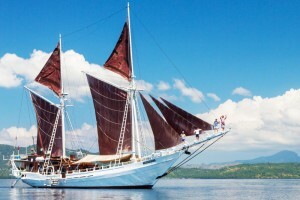 As we set sail for the beautiful Indonesian archipelago I would have you imagine for a moment the year is not 2018 and that you are not a guest on the wonderful ocean going ship, the Aegean Odyssey. Imagine instead that the year is 1818 and you are a simple sailor on board a trading ship of the Dutch East Indies Company bound to Ternate to pick up a cargo of fine spices and oriental silk. Such a cargo will bring a fine price back in the markets of Europe and although such voyages can be dangerous they are indeed lucrative. In 1818 the World was a different place than it is today. The 2nd war of independence between the USA and the UK has just ended with the treaty of Ghent and brings a final end to the hostilities between the two great nations and allows the beginnings of a friendship that will remain for two centuries. News reaches you that Napoleon has been well and truly defeated at the battle of Waterloo by the Duke of Wellington. Of course such things do not concern you as a simple sailor, you are preoccupied with the tales that the older seadogs tell during the long hours of the night watch. Stories as tall as the mizzenmast fill your head but you cant help wondering if any of them may just be true. The old sailors tell tales of tales mermaids waiting to charm you to a watery grave with their Sirens songs or stories of the sea monster known as the Kraken are rife amongst the crew. As you pass through the Sea of Flores that sits between the Moluccas islands to the North and the island chain of Indonesia to the south there is one story that you cannot shake. It is the story that some 100 leagues to the South there is an island. An island so wild and unexplored that even the natives on surrounding islands avoid it there. An island inhabited by fearsome fire breathing dragons that are worshiped as gods by savage headhunting cannibals. Can it be true that dragons that breath fire and are three times the size of a man roam over the island feasting on the human population at will? It is said that these dragons have wings of leather and sit perched high in the trees scanning the area for food. No it simply cannot be true…… or can it? Whatever the truth you are glad when daylight breaks and your ship turns northwards away from these mysterious waters. 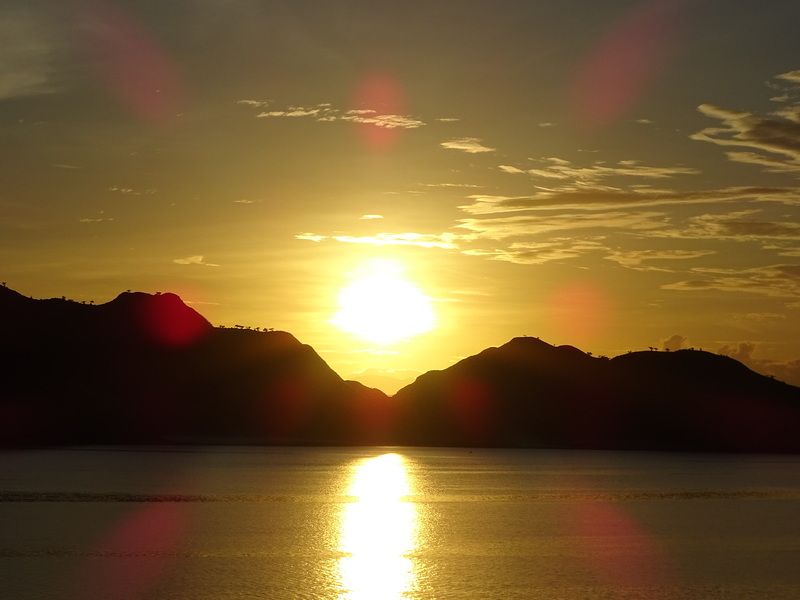 The secret of the island of Komodo will stay hidden for almost another hundred years…. Today as we enter the Sea of Flores having travelled some 3000 miles on the journey from Sri Lanka to Indonesia the waters are calm. We have been blessed with good weather and calm seas since Singapore. It is easy to imagine how the old sailors would have felt as their sailing ship slipped effortlessly through the mirror like waters. In the distance we see huge mountains rising up from the sea. The sun begins to rise and a unique view that I doubt that I will ever see again appears to me. The sun rises to my left and the moon sets to my right. A picture captures the moment forever. 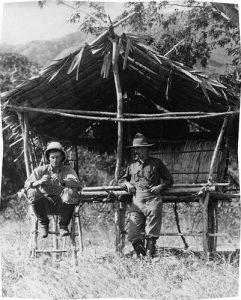 In 1926 William Burden an American entrepreneur come big game hunter described the island of Komodo thus on his first sighting. “The expedition could see the island, it appeared through the mists as a vast mass of torn and splintered mountains “. Today such a description still serves us well as the island appears in the early morning mist like a huge backdrop for some modern day horror film. Indeed the film King Kong was to be based on the island in 1933. It is easy to see how such tales would become legend and I admit to a feeling of apprehension as we plough ever nearer to out final destination. Our previous port of call was the remote town of Larantuka at the far eastern end of Flores. It is a port untouched and unspoilt as yet by the hand of tourism. Its simple people who are as yet still confused by the “strange foreign visitors” turn out in their hundreds to welcome us a shore. They are as much amused by our efforts to come ashore from the tenders as they are bemused as to why we should want to visit their humble town in the first place. Larantuka is the capital of East Flores and dates back to the Portuguese trading days of the 17th Century when attacks by the ever-advancing Dutch drove them east and they finally arrived at Larantuka. Here they took indigenous wives and settled their differences with local chiefs who allowed them to stay. They prospered as they exported the much sought after sandalwood to the west but after the island was eventually sold to the Dutch the old ways died out and the prosperity it once knew soon disappeared. Today the town has returned to the sleepy fishing port it once was. Whatever the feelings of these friendly people they are here, and they are in force. Smiling faces are everywhere; hands are extended to shake the hands of these strange light skinned westerners. Children practice their English with shouts of “Hello Mister” or “My name is Jamal. Where are you from?” Some of the travellers seem wary of these barefooted vagabond children clothed in brightly coloured T Shirts bearing Western Logos and clutch at their bags as if in fear of theft. The experienced visitor to these shores will know that such things are rare and they mean only to welcome us in the only way they know how. The town is a bustling hive of activity as local traders sell their wares. The ever-present motorcycles that are prevalent in the east buzz around the streets with a never-ending cacophony of horns, whistles and shouts from their riders. Once again the intention is to welcome rather than intimidate. Groups of uniformed small children skip along the busy roads seemingly unaware of the traffic. They clutch mobile phones to their ears with one hand whilst holding the hand of the child beside them with the other. There is sense of order here. A sense that time as passed these people by and that their way of life is as they would wish for. There is a feeling that all is well within Larantuka and I hope that the impending cloud of capitalism that sits on the horizon does not rain on their simple parade. Whatever the future holds for these beautiful people today it seems a million years away and as the tour buses fill and move out towards the village of Lewoloba the crowds begin to break up and wave us on our way. It seems that the entire of the village have for one day ceased in their daily routine to welcome us all. A huge plastic sunshade has been erected to allow us frightfully delicate Westerners to seek some shade from the hot humid Eastern sun. 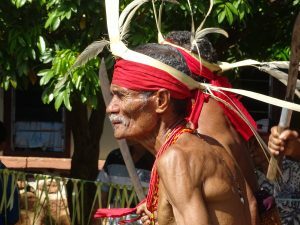 A small impromptu market as sprung up where the villagers sell their sarongs, throws and carved boxes at very low prices and the men of the village have decked themselves in the ceremonial costumes of their ancestors to offer a tribal welcome to their guests. Smiling dancing girls offer warm tea and cool towels to the weary visitors. Old men who speak no English and smile through toothless mouths need no words. They dance and wave parangs and spears with ease. A sight that I would imagine would once have bought fear to the hearts of their enemies. Today there is no threat, no fear. There is just a sense of the overwhelming pride that these warriors have to be able to show their culture to an adoring public. I manage to wander away from the madding crowd and make my way along a dirt track that leads into the village. Whilst I love the pomp and circumstance of the ceremony I am after all a naturalist and my first love are the beautiful animals and insects that inhabit these lands. A birdwing butterfly floats by carried by the gentle breeze and comes to rest for as fleeting moment on the brightly coloured hibiscus flower. My camera clicks and then again as I attempt to capture this amazing creature on film. An old woman peers from a window and laughs as the butterfly drifts away before I can take a third photograph. “Kupu Kupu “ she cries and points towards another mass of flowers. This time there are many butterflies all sipping at the nectar. I thank her with a smile and a nod of the head before focusing the camera again. The Indonesians have a habit of saying a word twice if it is plural, It makes sense really I suppose. The word for spider is “Laba” Spiders is “Laba Laba” similarly butterfly is “Kupu” whilst butterflies is “Kupu Kupu” You get the idea. I wander further in to the village spurred on by my success and am greeted by two young men sitting on a porch. The one clutches at old guitar. He is strumming it. I ask him he plays and although I fear they have no comprehension of what I am saying they both smile as I approach. 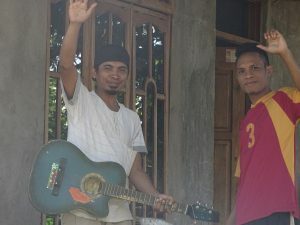 I ask if I might try the guitar and the young man hands it to me. It is old and it is out of tune but it is a guitar and I feel the need to tune it for them as best that I can. I manage to get three of the four remaining strings to a reasonable tune and play the song that is played in every karaoke bar from here to Jakarta….”Hotel California”. The young man smiles as he recognises the melody. I return the guitar to him and as I turn to depart he smiles and says “ The Eagles”. Music is a universal language and one that builds bridges across nations. All to soon it is time to return to the comfort of the Aegean Odyssey and it is with a heavy heart and a firm conscious commitment to return here some day perhaps on an expedition to catalogue some of the unique wildlife I board the bus. Larantuka fades into the distance as we sail through the night to arrive at Komodo. 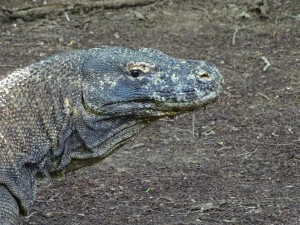 In truth the exploration of the island of Komodo and therefore the discovery of the magnificent creatures that inhabit it is really only a recent event. Until 1910 the island was largely unexplored and the presence of the dragon was still steeped in fable and myth. It was in that year that one Lieutenant Steyn Van Hensbroek of the Dutch Colonial Administration first heard the ancient stories and decided to find out if they were indeed true. With a small contingent of men he journeyed to the island. Imagine his disappointment when instead of head hunting cannibals he found only peaceful fishermen and instead of dragons he found lizards. Very large lizards it has to be said but never the less still lizards. 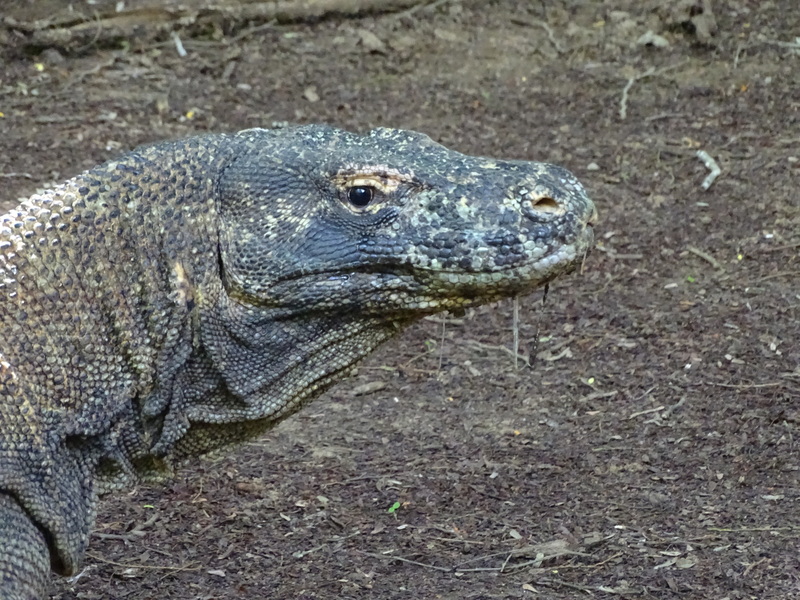 Over the years the Komodo dragon has now been recorded on a number of islands in the area, Komodo, Flores, Rinca, Motang and Padar although today they are no longer found on Padar. Hensbroek killed a specimen and sent several photographs to Dr. Peter A Ouwens who was director of the Zoological Museum and Botanical gardens at Bogor in Java. It was Ouwens who ascertained that these dragons were in fact lizards and not dragons. They did not fly nor did they breathe fire but the long yellow tongue could easily be mistaken as it flashed out in the morning sun. As a keen herpetologist it was Ouwens who assigned the so-called dragon to the family varanus and called it Varanus komodensis. In 1914 the world fell head long into the War to end All Wars and the island fell silent with the komodo being left in peace whilst the world destroyed itself around them. It is of course very easy for us 21st century naturalists to tut and shake our heads in indignation at such an annus crime as killing any animal but we should remember this was a different age with different values. Specimens of his expedition can still be found on display at the American Museum Of Natural History. By the 30’s the Dutch had recognized that these animal were limited in numbers and outlawed the practice of hunting them. Expeditions really came to a halt and with the outbreak of WWII the lizards shared their home with the occupying Japanese army. Since the end of the war many studies of the islands and its dragons have taken place and in 1991 the area was designated a World heritage Site by UNESCO. The Aegean Odyssey dropped anchor and preparations were made to tender us all to the island. There was much excitement. The previous evening I had given a lecture of Komodo dragons and it had been well received by a packed house of both guests and staff alike. The trip ashore was easy and pleasant with the sound of clicking cameras buzzing in the air. Arriving at a jetty we came ashore to be greeted by the local rangers and shore staff. The island is much managed now and the rangers whilst keen to show the visitors the dragons and other flora and fauna are also aware that the dragons on the island are not caged and wander freely. Paths have been made that allow the visitor to stroll comfortably around the well-trodden routes that lead to the “holding” area for the dragons. Here five large dragons can be seen all basking in the midday sun. They are not fettered nor are the fenced but instead allow us to casually gather around then to shoot video and take photographs. Occasionally one will stir but with the rangers standing between them and us there is no reason to fear these beasts. But of course Komodo Island has much to offer other than giant venomous lizards. As botanist the unique flora of the islands such as the lontar palms that cover the chain or the Chines apple trees. The hot and dry climate lends itself to savannah vegetation that suits the dragons perfectly and allows the existence of a number of endemic wildlife species. Birds such a the Black Napped Oriel can be seen flitting around and you may be lucky and capture a glimpse of the rare helmeted friarbird a native of Australia but often found in Indonesia. The Sulphur Crested Cockatoo is now critically endangered being found in a handful of locations in Indonesia. Over collection for the pet trade has greatly depleted the wild population of these beautiful birds. It is estimated that less than 7000 remain in the wild. The Timor deer is the main source of food for the dragons on the island. They are an introduced species and rely on the relative safety and isolation of the islands. Like many introduced species such as dog, boar and goats they survive and flourish. Now of course as an entomologist and an arachnologist it would be wholly unfair of me to miss out the best critters that can be found on the islands. To come to the tropics and not expect to see a spider or five would be ludicrous. I have studied spiders for over 40 years when as a boy I spent do much time frightening the girl next door with a spider in a matchbox that I eventually married her. I can wax lyrical for hours about spiders but will restrict myself to those found on Komodo for the moment. There is the Giant Golden Orb Weaver. If you are lucky enough to see one then stay a while and marvel at its huge web. A web that is so strong that in years gone by fishermen have used it to ply their trade. A passing-jumping spider sits on my sleeve enjoying the ride until he leaps for all he is worth and scurries off into the undergrowth. And so I would ask you all to remember that it is 2015 and we are all safely aboard this beautiful ship and it is thanks to those that who have gone before that we able to see these magnificent creatures protected in the wild in their natural habitat.